The late Edo era was the period when the production of Kutani porcelain, which had been vanished for a long time, was revived and the Akae style, red detailed painting, made its appearance. 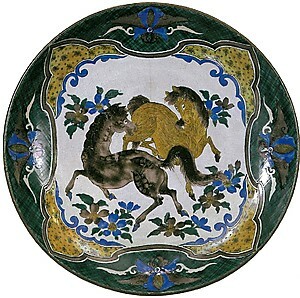 Approximately 100 years after the demise of Ko-Kutani production, the production of the Kutani porcelains restarted in Kanazawa, which was the castle town of Kaga clan, the “parent” clan of Daishoji clan. The Kutani porcelains were restored in Kaga province (present-day Ishikawa prefecture) with the technical guidance of Kyoto porcelain artists. 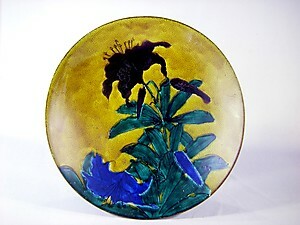 The effort did not last long, but a person inspired to restore Kutani porcelains with the collaboration of the creative Ko-Kutani designs and the newly introduced techniques appeared in the castle town of Daishoji. YOSHIDAYA Den-emon. A wealthy merchant living in Daishoji built a kiln next to the Old Kutani kiln at his own cost to make Kutani ware with the revival of Aote in his mind. The kiln named after his trade name “Yoshidaya” was called “Yoshidaya Kiln” and produced Kutani porcelains very close to Ko-Kutani in the artistry and quality, which were acclaimed by the the wealthy class and intellectuals of the day. But his efforts of pursuing the ultimate quality with a disregard for profit put the business in a predicament. He moved the porcelain production to the Yamashiro area, which was much easier to access, to restore the financial situation. Despite this, 7 years later in 1831 the business was forced to close down. After the closure of Yoshidaya kiln in Yamashiro, MIYAMOTOYA Uemon, formerly in charge of the kiln, took over and reopened it under the name Miyamotoya kiln. Miyamotoya kiln employed the Akae-style under the influence of the porcelain of the Kaga clan. 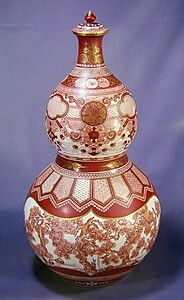 As IIDAYA Hachirouemon, the chief decorator, was preeminent in the detailed figures drawn in fine red patterns, the Akae porcelains from the Miyamotoya kiln also acclaimed high reputation and this privately owned kiln like the Yoshidaya kiln stayed in operation for more than 20 years. The closure of Yoshidaya kiln deteriorated the production of Aote Kutani, but it flourished once again in the “Matsuyama kiln” made by the Daishoji clan. As the Matsuyama kiln incubated potters to play active role in generation to come, the Matuyama kiln worked on the production of Aote Kutani ware till the abolition of the feudal system by the Meiji government.